• All 14 Big Ten volleyball teams are in action this weekend and will play away from home. 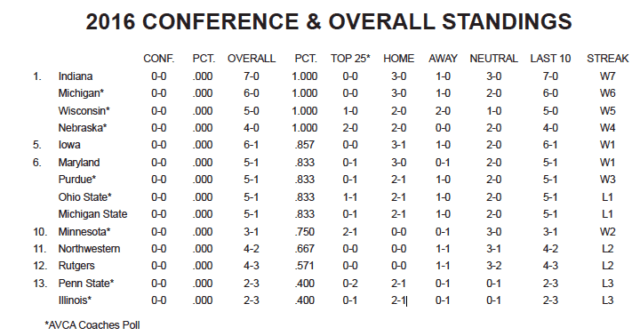 Conference teams will take on four ranked opponents. • In the first two weeks of non-conference of play, the Big Ten has amassed a 63-17 combined record, a winning percentage of .787. • Based on average attendance, the Big Ten has seven of the nation’s top 10 teams. Nebraska is No. 1, averaging 8,249 fans per contest, Wisconsin is third with 5,958, while Penn State checks in at No. 4 with 3,585 patrons. Michigan State ranks seventh at 2,329, Purdue is 13th with 1,950 people while Illinois (1,783) and Iowa (1,679) check in at 15th and 17th, respectively. 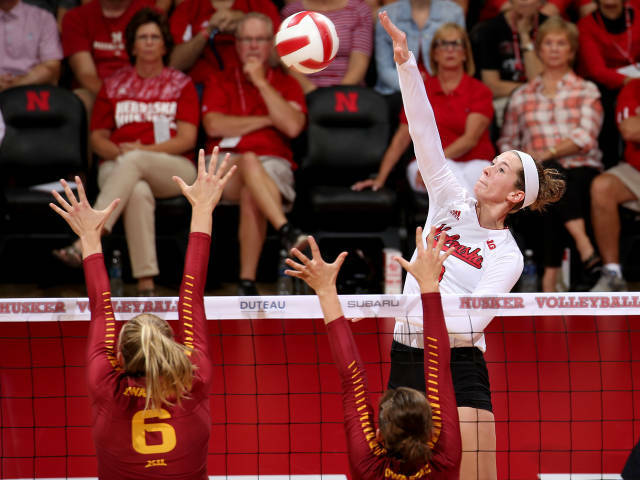 • For the second straight week, Nebraska was the unanimous top ranked team in the latest AVCA coaches poll. Seven other Big Ten programs are ranked in the poll: No. 2 Wisconsin, No. 5 Minnesota, No. 12 Ohio State, No. 17 Penn State, No. 20 Purdue, No. 21 Illinois and No. 22 Michigan. Michigan State is receiving votes in the poll. • Nebraska has posted a .363 hitting percentage this season, which ranks second in the NCAA. Northwestern ranks fifth, hitting at a clip of .325. Northwestern is eighth with a mark of .310 while Iowa ranks 10th with a .301 team hitting percentage. • Nebraska is averaging 15.31 kills per set, good for fifth in the country. Wisconsin is seventh with 15.25 kills per set. • Current Big Ten coaches have combined for 10 national titles since 1999. Penn State’s Russ Rose has won seven national titles, while Nebraska’s John Cook has tallied three. • Maryland’s Ashlyn MacGregor ranks second in the country averaging 2.26 blocks per set while Wisconsin’s Tionna Williams, the reigning Big Ten Defensive Player of the Week, ranks seventh averaging 1.73 blocks per set. • Maryland has held its opponents to a 0.084 hitting percentage, ranking fourth in the country. Wisconsin is sixth with its opponents hitting at a clip of .101. • Three current Big Ten coaches have been named AVCA Coach of the Year. Penn State’s Russ Rose has earned the award four times (1997, 2007, 2008, 2013), Nebraska’s John Cook has earned the honor twice (2000, 2005) while Minnesota’s Hugh McCutcheon earned the award last season.